To a molecular biologist, the word ‘evolution’ evokes images of fossils, dusty rocks, and phylogenetic trees covering eons. The fields of molecular biology and evolutionary biology diverged during the twentieth century, but new experimental technologies have lead to a fusion of the two disciplines. The result is that evolutionary biologists have the unprecedented ability to evaluate how genetic change produces novel phenotypes that allow adaptation. It’s a great time to start a new podcast on evolution! Molecular biology is an experimental approach that was born in 1953 with the discovery of the structure of DNA. Its goal is to understand how cells and organisms work at the level of biological molecules such as DNA, RNA, and proteins. Some of the experimental tools of molecular biology include recombinant DNA, nucleotide sequencing, mutagenesis, and DNA-mediated transformation. The experiments of molecular biology often involve simplified, or reductionist systems in which much of the complexity of nature is ignored. Variation in individuals, populations, and the environment are set aside. Data produced by the techniques of molecular biology can lead to decisive conclusions about cause and effect. Evolutionary biology embraces variation, and in fact attempts to explain it. The basis for variation in organisms is usually inferred by associating phenotypes, sequences, and alleles. The problem with this approach is that alternative explanations are often plausible, and conclusions are rarely as decisive as those achieved with molecular biology. We can turn to Darwin’s finches as a good illustration of the difference between fields. Darwin hypothesized that variation in the beaks of finches was a consequence of diet, but how such variation occurred was unknown. It was not until 2004 that it was shown that beak shape and size could be controlled by two different genes. The techniques of DNA sequencing, mutagenesis, and the ability to introduce altered DNA into cells and organisms have been the catalyst for the fusion of molecular biology and evolutionary biology into a new and far more powerful science, which Dean and Thornton call a ‘functional synthesis’. As a consequence, genotype can be definitively connected with phenotype, allowing resolution of fundamental questions in evolution that have been puzzles for many years. Microbes are perfect subjects for study by evolutionary biologists, as they are readily manipulable and rapidly reproduce. However no organism is now very far from the eye of this new science. Subjects as diverse as insecticide resistance, coat color in mice, evolution of color vision, and much more are all amenable to scrutiny by the ‘functional synthesis’. This Week in Evolution will cover all aspects of the functional synthesis, irrespective of organism. My co-host is Nels Elde, an evolutionary biologist at the University of Utah. 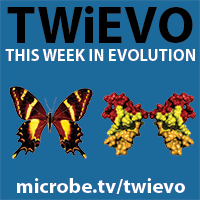 Nels has appeared on This Week in Virology to discuss the evolution of virus-host conflict, and his lab’s story on the evolutionary battle for iron between mammalian transferrin and bacterial transferrin-binding protein was covered on This Week in Microbiology. You can find This Week in Evolution at iTunes and at MicrobeTV.